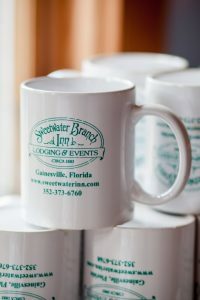 We take breakfast very seriously here at Sweetwater. Our delicious, fully homemade breakfasts are sure to satisfy your stomach. Made with local, farm-fresh ingredients, you don’t want to miss this complimentary addition to your stay! We are happy to accommodate any dietary needs or restrictions (vegetarian, vegan, gluten-free, etc. ), please just let us know in advance. 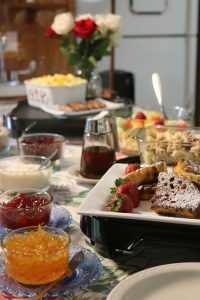 Our hot buffet is always stocked with freshly baked delicacies, crafted right here in the kitchen of The Cushman House! 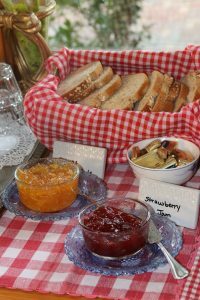 We also have a consistent cold breakfast bar, featuring homemade granola, homemade French vanilla yogurt, whole milk, and fresh local fruit, as well as English muffins and toast with preserves. View all of our complimentary amenities!